Metra is apparantly really short on power. If I understand correctly from looking at other forum topics & Metra documentation, 5 were painted this way to get them in service as quick as possible (although, judging by the recent topic, that has sort of backfired) and the other 16? are not yet in service, awaiting full paint jobs. 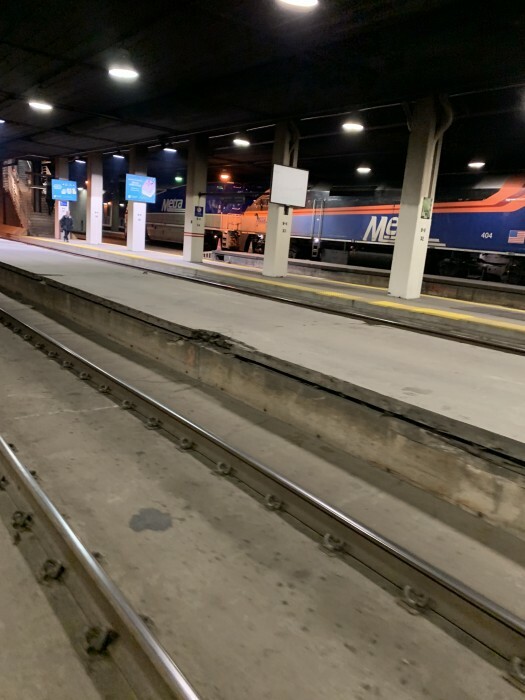 The initial six locomotives received an express paint job instead of the full Metra fade motif in order to get them into service as quickly as possible. These basically say the same thing? That's the hangup with new equipment. You basically have to work out the kinks. But these are used engines and that makes one wonder if they were working why the former agency sold them. Usually you sell something for a reason. They need to run them with the other engines to see if they do experience problems. Why you would put used unproven engines on the road alone seems to boggle the mind but if they are as desperate for equipment as is alluded to here that explains it. makes one wonder if they were working why the former agency sold them. If you had read the postings, it was because the state got a grant to convert it to high speed rail and got Chargers for Amtrak. No mystery there. But these are used engines and that makes one wonder if they were working why the former agency sold them. Usually you sell something for a reason. 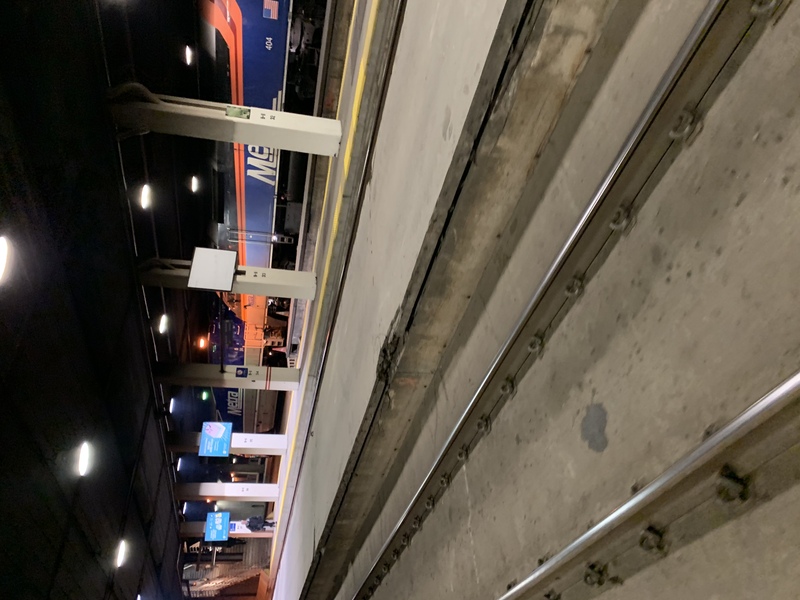 Caltrans got 22 shiny new Siemens Chargers, which seem poised replace the P42DC to become the next commuter and long-haul passenger locomotive for the US. They only needed 15 to operate the Pacific Surfliner, so they have a surplus in case of emergencies. This way, they made a little more money. What I can't figure out is if they were rehabbed during their time in California. I was able to run 91 before the storm. Its nice from a comfort standpoint. Quiet and ride smooth. They load slow...slower than the 400s. For now, they are a little hard to stop because of how the brake handle is set up. There are currently 2 or 3 operating on their own. A new batch will run as double headers when they are finished being converted. The only truly good thing about 405 (the Pumpkin) is the heat. Loads and runs super slow. so many FP59s paired with them. In Metra's wish list they wanted to convert DC motors to AC motors. On which locomotives did they plan on doing this? The F40's seem to take off just fine, being they run at notch 8, but do the 400's have DC motors? They take off slow and if they do have DC then AC could help them off the line like the F40's. I just saw this. These will be interesting. 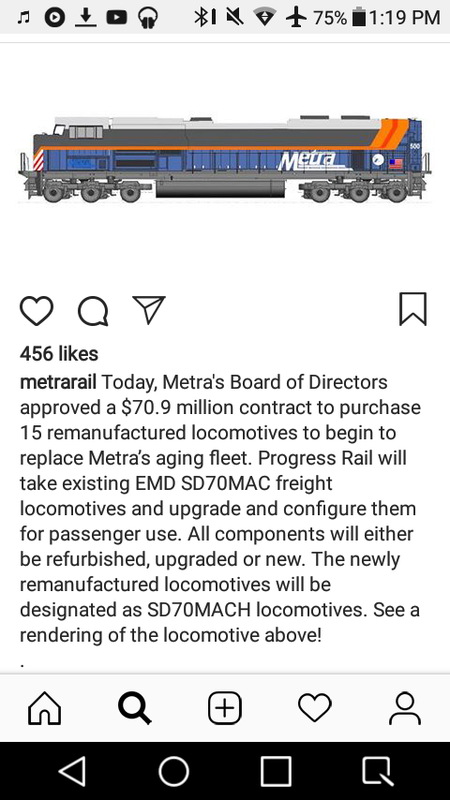 Does Metra not have the funds to just acquire new locomotives? So is this the beginning of the end for approximately 100-135? 21 ex Amtrak, 15 ex BNSF. Should be 150-173 first as the only F40PH-2 not to have been rebuilt by Progressive to F40PH-3. After that the oldest F40PH-3 r/b from 2009 and 2010 are 100-123. There are also another 3 F59PH on order from Progressive. They were bought last October. the 21 F59PHI and 3 F59PH just about covers 150-173. It is a choice. In the RFP announced in January 2018 they wanted either 12 new or 15 re-manufactured locomotives. Apparently the later came in cheaper and gave them more locos. Will these ever go on the UP-NW and N lines? Last time I did some research there was talk about the MP36 being to heavy for the bridges on that line. Will this be a factor with the new freight train locomotives? Well on the UP North line, I have seen freight depart waukegan but they usually head down to lake bluff and switch off to what I call the freight route. If you google mp36 and up north line there was some chatter about this. Once the UP-N bridge replacement has been finished the UP lines should be able to take any Metra loco. UP-NW bridges have already been replaced and I think UP-W bridges can already take the weight. As UP uses a common pool of locos and some trains come in on one line and go out on another until all \bridges have been rebuilt on all lines only lighter engines can be used. The W bridges can't, otherwise they would already have newer locos. No. UP lines are run by a common pool of locos. They do not restrict locos to individual lines so if one line cannot take heavier locos no lines are allowed to. They rebuilt UP-NW bridges in the 2000s by your logic UP-NW should have newer locos and it dos not. You just said the UP lines share locos. Therefore, by your logic, if one UP line can't run newer locos, no UP line will run them. UP West bridges through Oak Park and River Forest haven't been rebuilt. Those bridges also share CTA Green Line trackage. I did not say they had been replaced as they are doing on the UP-N now and on the UP-NW in the 2000s. However, the line through Oak Park and River Forest takes heavy freight trains every day so must be able to heavier Metra locos without any rebuilding. The bridges must have been upgraded to take heavier traffic, unlike UP-N or UP-NW. UP-N has no freight traffic and UP-NW minimal (occasional trip working out of North Ave yard). All of the lines were grade separated during the last 10 years on the 19th Century or the first 30 years of the 20th. This seems like the better explanation. Thank you. However the Oak Park and River Forest bridges are in dire need of repair with the Harlem Ave bridge being the worst.